Something I get asked a lot is about the expense of eating and baking healthily; many assume that it can be quite pricey. But guess what – it doesn’t HAVE to break the bank, there are ways you can keep the costs down while still making and preparing food that’s good for you. In collaboration with Voucherbox.co.uk, a site dedicated to finding the best free voucher, discount and promotional codes/deals, I’m keen to bust some myths and share my top tips for eating well on a budget. Whether you’re a student back at uni or just looking to keep your food shop bill down, I hope you find this post useful! Don’t worry, this doesn’t have to be a boring or tedious task and don’t think that you have to meticulously plan every single meal throughout the week. It’s just good to have a rough idea of what you’ll be cooking and eating so you can base your food shopping list on those items. See what ingredients can be stretched across a few meals and make bigger batches – for instance make a huge veggie-packed bolognaise and serve it with pasta one night, make it into a Shepherd’s Pie the other. Then you’ll be able to spend less time cooking and not get caught out and order a takeaway! Following on from the above point, one of the main culprits for spending more money than necessary it NOT having a list when you go food shopping. You won’t remember what you already have and you may be more likely to buy things for the sake of it. Of course, if you see something on offer or a new product you fancy trying, throw it in the basket – but try and stick to what’s on your list of essentials. Oats – Buy them in bulk for around 75p for 1kg and you’ve got the basis for porridge, homemade crumbles, flapjack bars…The list goes on. Not to mention if a recipe states ‘oat flour’ – make your own by simply whizzing a load up in a blender until you have a flour consistency then keep in a jar. Canned fruit (in juice) – In many of my healthy recipes, I use fruit or vegetables as the basis to cut down on fat and sugar. Tinned fruit like pears, peaches and cooked apple slices are ideal for blending into a cake or muffin mixture – just make sure you go for the ones in juice, not syrup! Sweet potatoes – An absolute staple, the opportunities are endless in both sweet and savoury creations with the humble (and super cheap) sweet potato. Mash it, bake it, roast it, even toast it… Go crazy! Canned pulses – Chickpeas, butter beans, kidney beans are another essential and make a super quick and inexpensive addition to so many dishes. I also like the drain and blend them to form the basis of brownies, blondies, cookies – yeh seriously, you should try it! A great source of protein for vegans and veggies too. Eggs – So versatile, whether your like them fried, scrambled, poached, cooked into an omelette, made into pancakes… A cheap way of boosting your protein intake while allowing you to mix them with many other flavours and ingredients. Frozen fruit and veg – Don’t turn your nose up at this, buying frozen can actually help to keep prices down, retain vitamins plus you don’t have to worry about them going off! Throw them straight into a smoothie or add them into cooking. Herbs and spices – No kitchen cupboard is complete without some cheap pots of herbs and spices. Depending on preference, I always have paprika, oregano, black pepper, chilli flakes, cinnamon, ginger and Chinese 5 Spice powder on hand to add to all kinds of healthy meals and bakes. 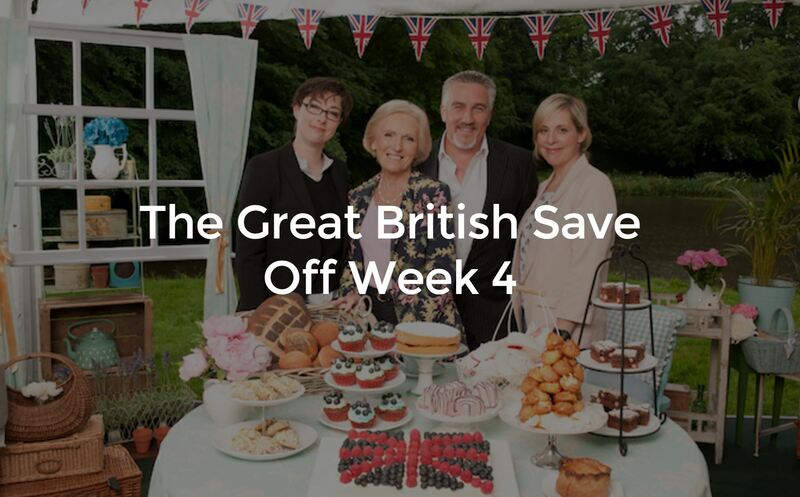 You’ll be pleased to know that right now Voucherbox.co.uk has created the Great British Save Off, a weekly price comparison of the recipes featured on The Green British Bake Off, highlighting the best value supermarket to buy ingredients from each week. This week’s star saver is Asda so make the most of these vouchers to knock even more money off your food shop! Another point to add is about buying own brand, don’t be a food snob! Most of the time, the quality and taste are just as good as premium brands and cost a little less, so why not? There may be a few things you are adamant on buying but be a bit stricter with yourself and try the supermarket or independent shop’s own version, you might be pleasantly surprised. A pot of yogurt goes out of date tomorrow. Those tomatoes are looking a little less than fresh. Not sure how much longer those bananas will last… But don’t give up on them and chuck them in the bin! One of my biggest pet hates is wasting food, so instead get creative and think how you can make the most of tired fruit and vegetables, or something that’s just about to go off. It doesn’t have to be the most extravagant creation ever, but be a bit adventurous and use what you have in your kitchen. You never know, you might come up with the weirdest but most amazing concoction ever! So there we go, I hope you find these money-saving tips helpful and see that it’s possible to eat and bake well while still sticking to a budget. We all have different food shopping habits but if you take even a few of these on board, you will hopefully see some savings every month. Thanks to Voucherbox.co.uk for the opportunity to write this sponsored post.